This post has been stirring in my heart for a while. It seems that almost every conversation I have had for the last few weeks has just confirmed the need for me to write these words down, even if only to humble myself into accepting them. I myself am guilty of what I’m about to write about, as many of us are, and I apologize. We all, at any point in our lives, have a friend or loved one who is hurting. Death. Sickness. Divorce. Infertility. Special needs. Mental illness. The loss of a job. The loss of a child. The loss of a parent. The loss of a home. The loss of an ability. The loss of a friendship. Addiction. Affairs. Abuse. Straight-up drama. We can all call to the front of our minds someone we know who is going through something painful. I can name a friend for almost all of the above-mentioned situations, and it’s sobering. Pain is all around us, even when it doesn’t directly affect us. We cannot always protect those we care about from experiencing it and we cannot walk this earth without at some point feeling it ourselves. Pain is a part of life, and a very important part at that. And while pain is, at some point, unavoidable, that does not make it dismissible. My oh my, how many times have we heard the plight of a friend and commented to ourselves, “If I were in that situation, I’d……”, almost with a sense of superiority, as though our opinion of their situation held more weight than the situation itself? We go on and on, offering our opinions instead of our support, proud of ourselves for having it all together and never realizing how lucky we are to be able to view the pain from the outside. Or we apply our own experience. The fact is, pain is not quantitative. There is no way to measure what another person is going through, therefore there is no way to compare what they’re going through. There is no expiration date for grief, no way to determine when an appropriate amount of time has passed before one must “get over it”. Whether a pregnancy was lost in the early weeks or in the delivery room does not hold any weight to the pain felt. There is no “at least” that will bring comfort to the persons who have said goodbye to someone they love – “at least you were only 6 weeks pregnant”, “at least you know you can get pregnant”, “at least you had all that time together”, “at least they went quickly”, “at least you had time to prepare yourself”, “at least you had a chance to say goodbye”, “at least you’re young”, “at least they were old”…. there is no “at least” that is bigger than the hole left behind. Disappointment is not relative. A friend of mine delivered her first baby a few years ago and was deeply disappointed over the experience, as it had not gone as she’d planned and prepared for. In the middle of her tears she said, almost apologetically, “I know, at least I didn’t have to have a C-section like you, so I should be grateful…” NO. Disappointment is not relative. My disappointment being different from her disappointment does not make hers less, and does not make mine more. It’s okay to admit disappointment – it’s not the same as discontentment. And that old monster “At Least” has no place in disappointment. “At least” hints that the pain that is felt is too great, that the feelings experienced are not proportionate to the situation. But as grief cannot be quantified, there is no such thing as proportionate pain. Mourning is not morning – it is not over at a specific time. A death, a divorce, whatever has ended has an effect, and your opinion of how long the process has taken does not speed it up. “Long enough” is not helpful, is not supportive. It does not push one towards healing, but rather towards isolation. If someone cannot share their pain with you because of how you attempt to measure or judge it, they will keep it to themselves and share the burden of their feelings alone. While we are not meant to be sad, we are meant to feel sadness when it arises. One of the most powerful representations I’ve ever seen of its importance was, of all places, in a Pixar movie. If you haven’t seen Inside Out, go rent it tonight! The main character, Joy, obviously wants everything to be happy all the time, as do most of us. Social media, Pinterest, tv, Instagram… we’re surrounded by the most perfect and joyous of images and messages all day long, and we like it. We strive for it. But when something legitimately sad happens, Joy tries to push through, move on, gloss over it and pretend like it wasn’t as bad as it seemed. In the movie – and I promise you I paused immediately after this scene to wipe my tears and explain how impactful it was to my kids – Sadness sits down and talks about how sad it is. She lets the tears flow, admits that it is sad, and feels the pain of it all. Once this has happened – and ONLY after this has happened – are they able to move on in their journey. Sadness must be felt. We have to acknowledge how painful something is before we can begin to heal from it. To become stronger we must admit we were once weaker, and accept that neither is better than the other. Sadness, pain, grief, mourning, disappointment – they’re all very real emotions that will take place regardless of our opinion of the circumstances they showed up in. Ah, the circumstances. This one is tough, because all too often the circumstances of one’s pain create an excuse for others to dismiss them. You never liked that friend’s husband so you’re not sad to see their marriage fail. You don’t do drugs so you have a hard time feeling compassion for those who lose everything to addiction. You would never let your kids behave so poorly so you feel justified when someone else’s teenager runs away. You know he cheated before so you have a hard time feeling sorry for your friend who stayed anyway when he does it again. You judged their spending habits or their low-paying jobs so you judge their bankruptcy or their pleas for help. You had success with a weight loss program so you are exasperated with your overweight friend. But our opinions, again, are not helpful. They didn’t protect anyone from getting hurt and they certainly won’t help anyone to heal. To put it plainly, it truly, 100%, completely, wholly DOES NOT MATTER what we think. We do not get to decide who is deserving of their pain. Not agreeing with another’s pain does not negate it. Just because you don’t agree with someone’s divorce does not mean you can drop off a casserole and hope it goes away. Your discomfort is not a factor any more than your opinion. People around us are hurting, and we are not called to sit in judgement of them. We don’t have to like what’s happening, only love the person its happening to. That’s what it all comes down to, really – judgement. We think we know better, think we’d do better, feel we’ve done better. But the hurting ones around us are not asking for our expertise, they’re asking for our compassion. One of the most humbling experiences of my life has been to tell someone I love that I support their decisions because I support them, and then watch them make a decision I would not have made. So what am I to do now? Do I withdraw my support because I disagree, or do I swallow my pride and recognize that my opinion is literally worth nothing in such matters? Do I henceforth offer only conditional support to loved ones in the hopes that they’ll do what I want them to? Do I sit in bitter judgement and disbelief at their choices, or do I thank God that I am not in the same boat, having to make the same ones? Do I turn up my nose or lend them my ear? So stop telling people to get over it already. Stop telling yourself you’d do any better. 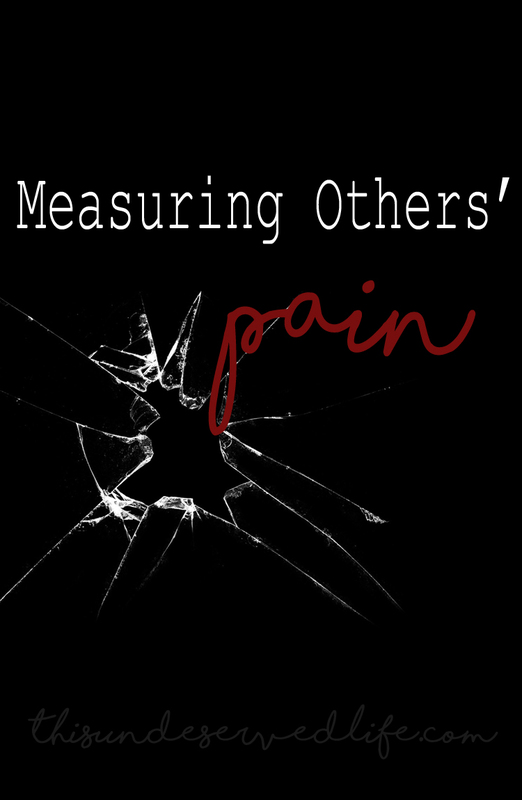 Stop trying to measure someone else’s pain and stop kidding yourself that you even can. Start listening without forming an opinion. Start acknowledging sadness when you’d rather stick your head in the sand. Start accepting that there is only so much you can control, and it’s even less than you think. Start being a friend instead of a jury. And for the love, stop telling people how to feel.